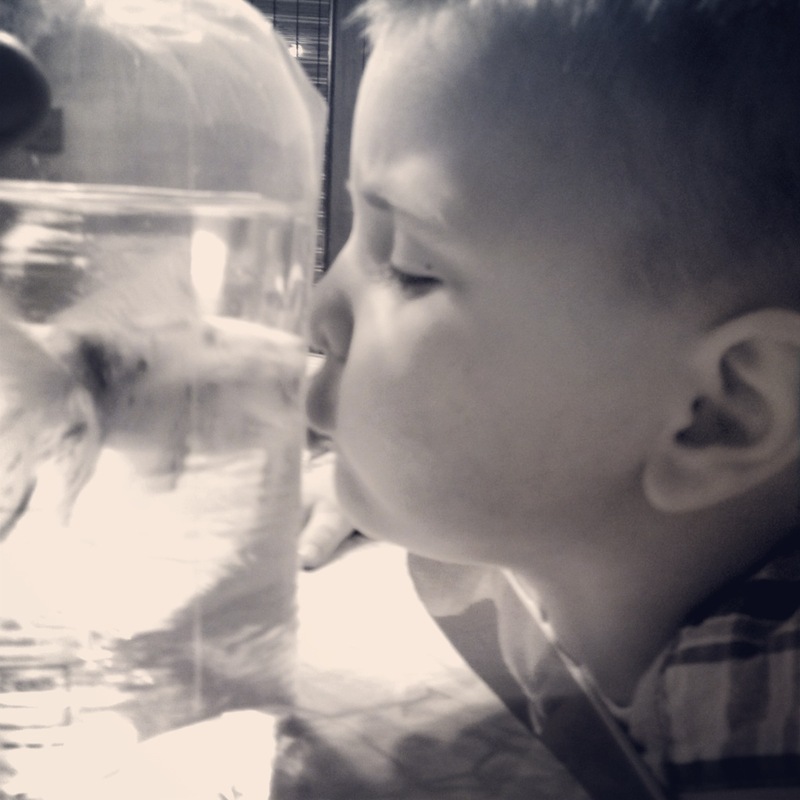 This past April my wife and I bought a fancy fantail goldfish for our grandson, Connor, for his birthday. We, of course, let Connor pick it out, along with all the “stuff” that one needs for a new goldfish: rocks, tank, decorations, etcetera. Naming animals is always a family affair with us and this new pet was no exception. It took an hour or so and several discarded candidates before my wife offered up the winning moniker: Jonah. Connor loves old Jonah and is so cute watching him and especially at feeding time when he almost always says, “Papaw, somebody looks hungry!”, which makes me laugh every time the event it repeats itself. A little over a week ago Jonah began to act odd: Staying hidden and low in his tank almost all the time, not being at all active and not eating, something he excelled at! I diligently changed his filer, added medicines and anti-stress “stuff”, and performed multiple partial water changes trying to revive his health. At one point it looked like Jonah had turned the corner, too, but alas it wasn’t to be: Jonah went to the big fish tank in the sky late last Saturday. My wife wasn’t too concerned about the tragedy, she thought a four year-old wouldn’t even notice the fish was gone. But I had doubts, big ones, that she would be correct on this issue. Time would surely tell who was right and who wasn’t since Connor would be back with us Monday after school through Tuesday evening. Connor hadn’t been home from school more than 10 minutes when he looked at me and asked “Papaw, where Jonah at?”. My response hadn’t been thought through or rehearsed in any way, I was shooting from the hip, when I answered him “He is at the fish doctor. He got sick, like Gypsy did and had to stay at the dog hospital, and will be home Friday.”. Without missing a beat, I had avoided “the death talk” and a crying little boy; I was pretty proud of myself I have to admit! Part of my errands today involved picking out a “new” Jonah. I had studied that fish, both before and after his demise, pretty well so as long as there was one in-stock I’d be in good shape, I was sure of that. They lady who netted my pick of the tank was pretty patient with me (after I told her the story), netting and releasing at least three other fish before finally chasing down the soon-to-be Jonah; he was a spunky fish that eluded her for several minutes, I was glad to see that zest in him. When “we” got home I realized that I had yet to clean out the old tank for the new fish. So, I set Jonah (it’s officially his name at this point) safely aside in his bag and began to clean, rinse, and wash the tank and the entire contents. I must have had help setting the tank up the first time, though I don’t recall it. I made quite the mess sloshing the tank and water across the kitchen to the metal cart that serves as the fish tank stand, which I;d have to clean up, and is still drying as I write this. But within an hour the tank and all of its “stuff” were cleaned and dry and Jonah was in the fresh, treated water, looking pretty happy to boot. As I cleaned up the mess I began to contemplate the decision I had made to spare my young grandson “the death talk” at this time. It was during this time that I remembered that my own children were merely five and seven when they experienced their first real encounter with death: My grandmother’s death in October 1995. I hadn’t expected them to react with the emotion they did: They were too young to really grasp it I had, in my youthful ignorance,, thought. But they most assuredly were not too young I quickly learned, as I comforted them and wiped their tears, still somewhat in shock myself both at their grief and in my own. Sooner or later we will all experience death on some level, be it a “Jonah” type situation or one like that of my grandmother’s passing. Did I do Connor any favor by avoiding “the death talk” over Jonah? Was “saving” it for another time/creature/person really a good idea? In retrospect, probably not. Now I don’t know if the knowledge of death will come to him through a small matter, like a goldfish, a larger one, perhaps one of our dogs, or worse of all from a family member. And I don’t know who or how that event will be dealt with. If I had it to do over with I would have handled it very differently. Hopefully I have learned a valuable lesson here and will use it to good effect in the future. The other day my wife was mowing the lawn; she always does the mowing since I’m unable to do so. Our grandson, Connor, was in the yard playing while she was working. Every so often he would holler at her or say some thing to her. Every time he spoke to her she paused and replied. I found this a little odd since normally when she is mowing and I need to get her attention it takes a lot more than speaking to her: yelling, waving my arms, maybe even throwing some thing at her is required. Obviously she was much more attuned to Connor than she normally is anyone else while she was working. The Bible teaches us that if we will draw closer to God, He will draw closer to us. The more open our spiritual eyes and ears are the more apt we are to clearly hear the Lord when He speaks to us. Spending quality time in the Word and prayer is the best way to become attuned to hear His every call and feel His sweet presence.